Charges the 2.0 Ah battery in 40 minutes and the 4.0 Ah battery in 80 minutes. 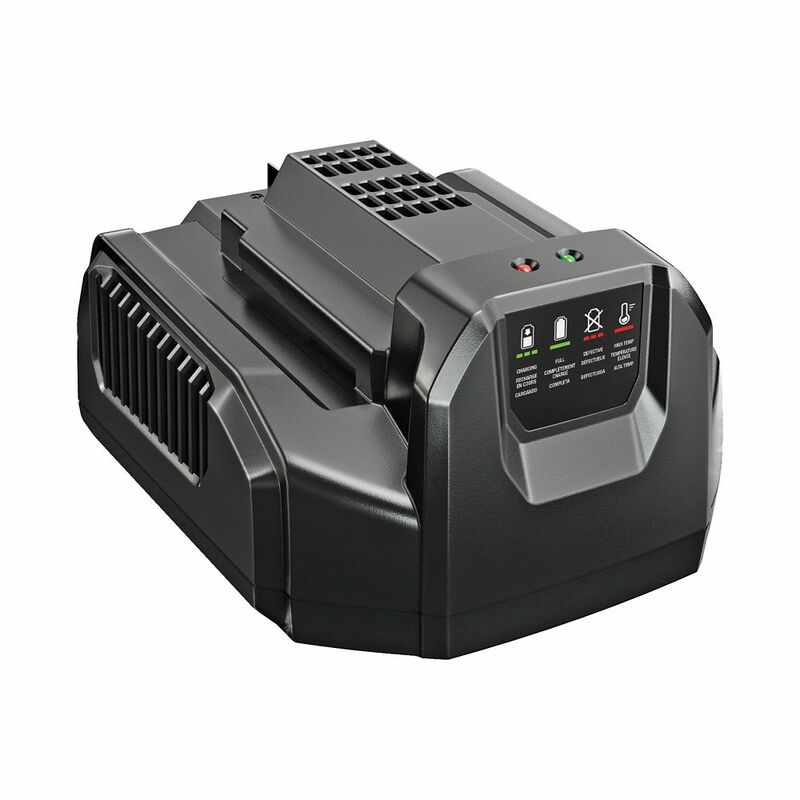 The DEWALT DCB118 20V MAX* Fan Cooled Fast Charger is compatible with all 20V MAX* and 60V MAX* DEWALT Batteries. The internal fan pulls air across the battery to cool and reduce hot/cold pack delays. This fan assisted cooling results in faster charge times and reduced downtime in the field. Batteries not included. Introducing the worlds first String Trimmer with POWER LOAD Technology. This patent pending technology solves for 1 of the biggest pain points of string trimmers. Replacing your string line is as easy as feeding the line into the head and pressing a button. The NEW EGO POWER with 15 POWER LOAD String Trimmer has Carbon Fiber shaft that is stronger than any other string trimmer shaft on the market today. The shaft is equipped with a lifetime warranty so the strength and durability is guaranteed to last forever. This revolutionary trimmer is also built with a hi-efficiency brushless motor, bump feed line advance, 0.095 professional cutting line, and is compatible with all EGO ARC Lithium batteries to maximize the convenience of cordless and deliver Power Beyond Belief. 56V Standard Charger The EGO POWER+ system boasts a revolutionary charging system. In just 40 minutes, a depleted 2.0 Ah battery can be fully recharged with the 56-Volt Charger. The active-cooling fan system supports rapid charging without overheating. The quick recharge capability ensures limited downtime with any battery in the EGO platform. 56V Standard Charger is rated 4.7 out of 5 by 230. Rated 1 out of 5 by Charlie from I was totally disappointed in this product. It did not... I was totally disappointed in this product. It did not last more than 20 minutes max. Not worth the money at all! After spending $300 for charger and battery on top of the $200 spent for the leaf blower I would never advise anyone on this product. I will go back to my black and decker! Rated 5 out of 5 by Tricky Ricky Dicky from 56 volt+ charger Quiet and fast. Easy to read lights. Easy or understand coloured blinking lights. Rated 5 out of 5 by Lawrence from Charger Nice built charger. Well made. Battery is well made and engineered. Alot of thought and planning went into design. Batteries are very expensive, but appear to be well made. Rated 5 out of 5 by Justin from Awesome buy Charges my 5 amp hour battery pack in a little over 1.5 hours, depending on the depletion level.